THE CORBITT PRESERVATION ASSOCIATION WOULD LIKE TO SAY CONGRATULATIONS TO THE GRADUATING CLASS OF 2017. THIS IS NOT THE ENDING OF YOUR EDUCATION BUT JUST THE BEGINNING. AS YOU CONTINUE YOUR LEARNING AFTER HIGH SCHOOL, WHETHER YOU ARE CONTINUING ON TO COLLEGE, TRADE SCHOOL OR GOING ON TO WORK, YOU ARE JUST BEGINNING YOUR JOURNEY IN LIFE. LIFE IS A LEARNING PROCESS. IT’S UP TO YOU TO DECIDE HOW MUCH YOU WISH TO LEARN. MY STRONG ADVICE WOULD BE TO ALWAYS CHOOSE WISELY AS YOU LEAVE THIS SCHOOL. YOU CAN BE ALL YOU CAN DREAM TO BE. THIS 2017 R.J.CORBITT MEMORIAL SCHOLARSHIP IS GOING TO A FINE YOUNG MAN WHO WILL BE ENTERING NC STATE UNIVERSITY THIS FALL. HE CONTINUES A LONG LINE OF RECIPIENTS WHO HAVE CHOSEN NC STATE UNIVERSITY TO FURTHER THEIR HIGHER EDUCATION. HE IS ALSO THE BROTHER OF OUR LAST SCHOLARSHIP WINNER WHICH IS A FIRST FOR OUR ORGANIZATION. Christopher V. Pendergrass giving the Valedictorian speech. 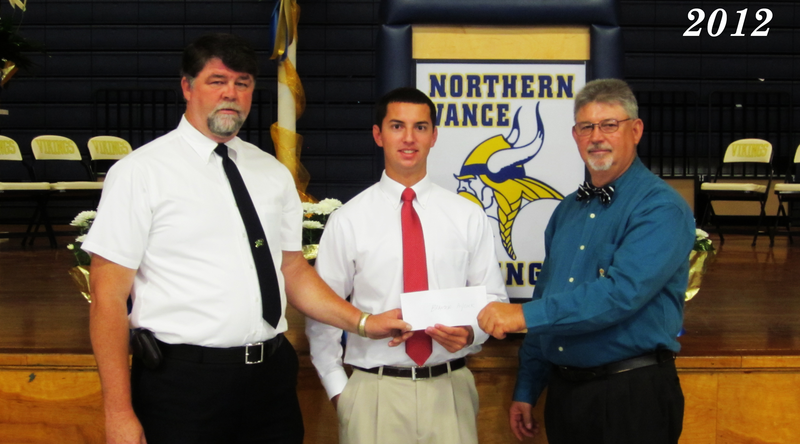 The 2015 R. J. Corbitt Memorial Scholarship was awarded to Christopher Vernon Pendergrass III on May 18, 2015 at the Northern Vance High School Class Night held at the Vikings gymnasium. Christopher excelled in his senior year graduating with a GPA of 4.0 and a weighted GPA of 5.148. Christopher was in the top 10% of his class. He was selected as a Co-Valedictorian as well. 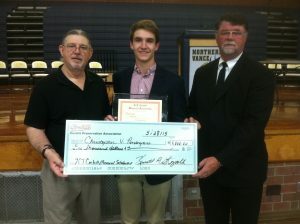 Christopher received the prestigious Jerold P. Murdock Memorial Scholarship as well. 2015 saw Christopher inducted into every honor society offered at Northern. He was a member of the National Technical Honor Society, the National Honor Society and was a North Carolina Scholar. 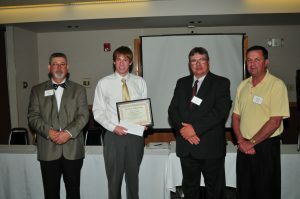 He also received the prestigious President’s Award for Academic Excellence. Christopher will be attending North Carolina State University this fall enrolling in the Mechanical Engineering program. We wish Christopher the best. 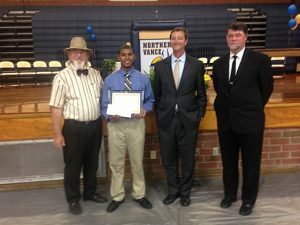 The fifth annual R. J. Corbitt Scholarship was awarded to Dwayne Ernest Jefferson on May 22, 2013 at Northern Vance High School. His GPA was 3.6 unweighted with a weighted GPA of 4.4 and was number thirteen in the Class of 2014. He was a North Carolina Scholar, a National Honor Society member, a National Technical Honor Society member and received a President’s Award for Academic Excellence. The scholarship was in the amount of $1000. 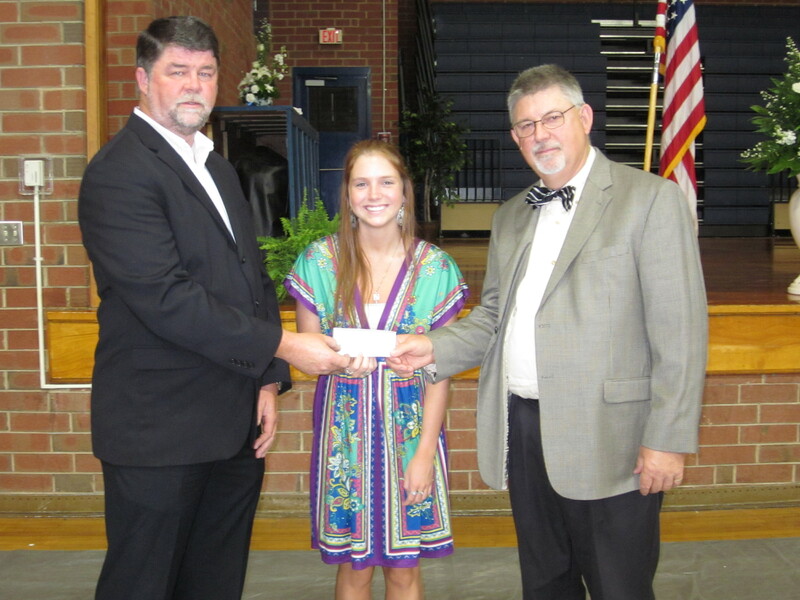 The fourth annual R. J. Corbitt Scholarship was awarded to Millard Thomas Abbott on May 23, 2013 at Northern Vance High School. He is from Henderson, NC and is attending UNC-Charlotte Engineering School in the fall of 2013. Jeff Arthurs (engineering and architecture instructor) said Millard was one of the best students that he has ever taught. His GPA was 3.83 with a weighted GPA of 4.70 and was number two in the Class of 2013. He was awarded numerous scholastic awards. The scholarship was in the amount of $1000. 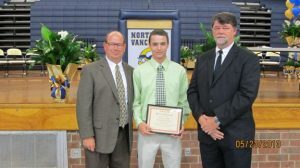 The third annual R. J. Corbitt Memorial Scholarship was awarded to Brandon Aycock on May 24, 2012 at Northern Vance High School. Brandon is attending the NC State School of Engineering in the fall of 2012. Brandon completed his high school curriculum under Mr. Jeff Arthurs. Brandon attended all three classes; drafting, engineering and architecture. Brandon finished his high school with a 3.75 GPA (4.45 weighted). He was a member of the National Honor Society and the National Technical Honor Society. He was chosen for the President’s award for academic excellence and was a North Carolina Scholar. Brandon was not only in the top 10% of his class but he was also one of the top 10 graduates of the class. Congratulations Brandon! Caitlin Cockrell the recipient of the 2011 R.J. Corbitt Memorial Scholarship given by The Corbitt Preservation Association. 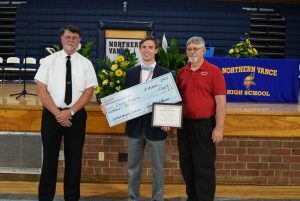 Each year a Northern Vance High School student is awarded this scholarship for academic excellence in the engineering program. Caitlin had a 3.6GPA and a weighted GPA of 4.2. Caitlin will be attending college this fall at NC State University in the engineering program. Caitlin was in the top 10% of her class and was also designated as a North Carolina Scholar, National Technical Honor Society and the President’s Award for Academic Excellence. Each year this scholarship is given to a student who intends to pursue a career in engineering and attends a four year higher education program at a college or university in North Carolina. A student is also eligible if he/she attends a two year program with intentions of transferring to a four year program. Congratulations Caitlin! We are proud of you! If you were at the 100th Anniversary banquet on April 30, 2010 you were the witness to a first in our organization. At our annual business meeting held in February the membership was presented with a proposal to establish a student scholarship in the amount of $500 to an engineering student at Northern Vance High School. This scholarship is available to a student who is pursuing a two or four year degree at a community college or full university. The motion carried unanimously and was thus named “The R.J. Corbitt Memorial Scholarship”. I am proud to announce that the winner of the first scholarship is Adam Daeke. Adam and his brother Aaron were present along with his instructor Jeff Arthurs at the banquet. 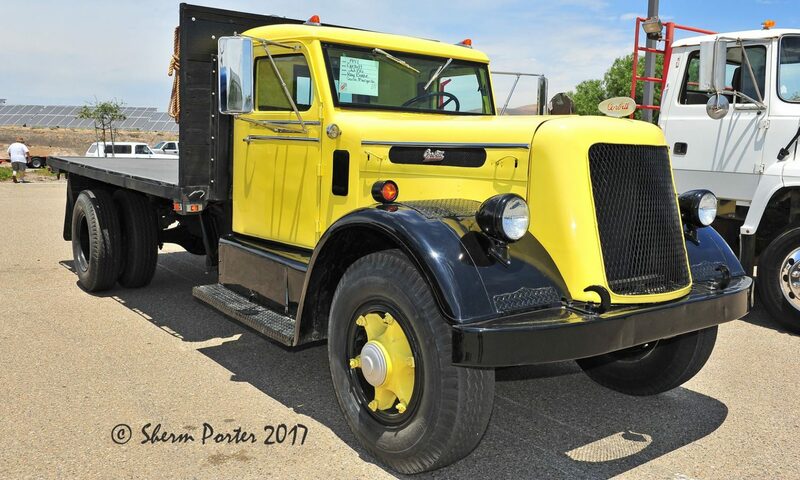 Their project, a 3D animated model of a 1952 D802T35 Corbitt was presented to the membership. It had overwhelming approval. Adam to his surprise was presented his scholarship check and a nice awards plaque. Adam will be attending North Carolina State University this fall. We would like to wish Adam our best regards as he is truly a remarkable young man. Congratulations once again Adam!